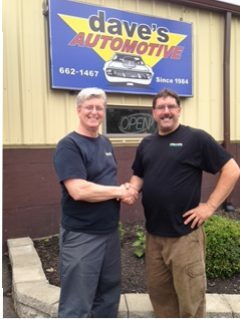 The automotive industry is constantly changing, but at Dave’s Automotive, taking pride in their client relationships and work performance has never gone out of style. It has been their passion for since 1984. If your goal is safe, reliable transportation and peace of mind, let Dave’s Automotive provide repairs and maintenance for your vehicle with quality AC Delco and other top brand parts that meet or exceed the manufacturer’s standards. Owner Steve Hudson and the team at Dave’s Automotive understand that sometimes vehicle repair can be stressful. Their friendly service staff will explain all work before it happens to help their clients feel confident and satisfied with their service experience. As a dealership alternative, Dave’s Automotive is able to provide factory-scheduled maintenance for all newer vehicles and many used vehicles still under warranty. It’s the best way to protect your investment and will not void your manufacturer’s warranty. From Pennzoil lube-oil-filter service, tire sales and service, to diagnostics, New York State safety and emission inspections, steering, suspension, exhaust, wheel alignments, brakes, transmission, climate control and driveability issues, Dave’s Automotive provides complete service. Other services aluminum and steel welding and fabrication work, restoration. With Steve’s background in auto racing, he also has experience with performance improvements, from classic muscle cars to custom high horsepower engine and chassis modifications. We specialize in nitrous oxide system installations. Always remembering where we came from and how we started reminds us how valuable each customer is and we promise to service every one of you with honesty, fairness and respect.